Chris (Stuff As Dreams Are Made On) wrote a post yesterday about his TBR pile and admitted that he had 204 books on that list right now. I don’t dare count mine, but it’s a fearsome list, with many shelves in the house filled with books waiting to be chosen, and many on my list added after reading all your blog reviews. In the corner of one bookshelf sits a two-volume set that I have yet to read. I’m very fond of it, glaring at me in consternation as I pass by. They sat on my Dad’s bookshelf for many years… unlike me, however, he had read them. I just keep plugging away at the books I want to read, pulling them off the shelf as they call to me, donating them to the library when done, or sharing them with friends and family. More are added to the list exponentially, but I refuse to worry about having so much to read and so little time because it’s such a lovely way to spend my time. This entry was posted in Book lists on January 16, 2009 by Robin. Here’s to creeping along with you. At least we won’t run out of things to read! At least we won’t feel compelled to buy more! (Maybe.) I’ve left you a small token of my appreciation on my blog. I love your attitude about refusing to worry about having so much to read!! I need to take that attitude on as well. I haven’t counted my TBR list and I bet that it is around 200 at least! I continue to add to the list! I love your way of looking at it. And Bellezza also said it perfectly. I kid about my TBR pile, but really, it is only that size because I want it to be that size… I really shouldn’t complain! That being said, I will never count them. I love the glaring books. Lezlie, the glare grows on you! Thanks, Bellezza. What a lovely token of appreciation. You are wonderful! Thanks, Red lady-Bonnie! I don’t dare count my TBR list! The more I chip away at it, the more it grows! I agree with you, Kailana. No complaints here. Me, too, Bookfool!! And if they put me away somewhere without books, they’ll have to put earphones on me and play audiobooks to keep me calm! I’d be afraid NOT to read On The Mormon Frontier. Glaring at you in consternation indeed. Quite literally! I’m with Lezlie. It’s just a bit creepy to see that face staring out from the shelves. Bybee and Petunia, I know…there is that feeling that I’d better read it, or else! We are indeed fortunate to have so many wonderful books available to us. I’m glad to be living in a place and time when books line the shelves. And it’s wonderful having blogger friends who recommend such great books. That face on the spine of those two books is ‘fearsome’. Is that supposed to be Joseph Smith? Booklogged, well said. We are so fortunate to have so many wonderful books to line our shelves! 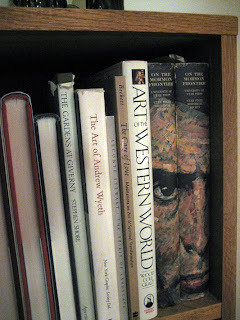 And, no, the cover of the books is a painting of Hosea Stout by the wonderful Utah painter, Alvin Gittens. The books are actually a 2-volume edition of Hosea Stout’s diaries. If you go to Google Images and type in “On the Mormon Frontier” you can see the photo that Gittens must have used to do the portrait. It’s pretty “fearsome” (intense) itself! I agree with Lezlie. I think they would remind me I hadn’t read them yet! And then I’d feel guilty too…and no matter how much is on my TBR pile, there’s so much more to get! lol I do have times when I don’t buy much and read what I have. my TBR pile is like Chris’s and yours….isn’t it fun that we have that much to read?